First line: "This time we were in the Great Room enduring another etiquette lesson when bricks came flying through the window." As dystopians go this is a fluffy, light-hearted, enjoyable conclusion to The Selection trilogy. America Singer lives in a future with a strict caste system, where once in a generation, the prince of the land holds a televised competition for his bride. As a Five, she and her family scrape by with careers in the arts and a lower-middle class standard of living. She's secretly fallen in love with Aspen, a Six who struggles even more than she does. Meanwhile, her parents are only too happy to see America chosen for the competition, with an opportunity for their daughter to become the princess and for everyone in their family to be catapulted several castes higher. Gradually, America starts to fall for hunky Prince Maxon, a poor little rich boy, and her own good looks and thoughtfulness begin to win over the public as well. 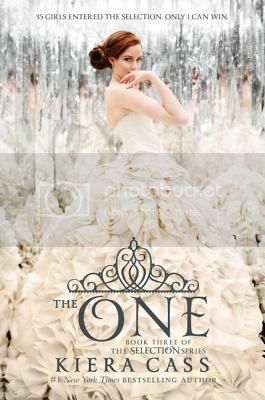 As the final installment of the trilogy picks up, America really has fallen in love with Prince Maxon, and the two of them announcing their engagement seems like a forgone conclusion. There is some trouble in paradise, however, as America grows jealous of the way Maxon still openly flirts with the other contestants, and she wonders if she can really bear to give up Aspen (who has now bettered his life situation by signing up to be a palace guard.) The main thing that bothered me is the same thing that bothers me about any reality-TV dating show, where the "star" is going on dates with multiple contestants, but the contestants are expected to stay loyal to the star. What a double-standard! The political situation with the rebels heats up, and there is a dramatic event at the end of the novel which changes quite a lot, but I expected there to be an even bigger twist at the end. Finding out that America's father was secretly a rebel didn't feel that shocking. I thought the monarchy would probably be dissolved, but Maxon hangs on, with a promise to gradually end the caste system, starting with improving the lives of the Eights, those who live in homelessness and total poverty. This is a feel good, fun love-triangle romance, perfect for Meg Cabot readers, or teens ready for The Hunger Games "lite." Great review! I agree with you on your categorization of the book; I was calling it "dystopian lite" to anyone I discussed it with.